The ABW team conducted assessments of health care facilities that ABW is involved with on the northeastern part of Tanzania. Sometimes a hospital has the most interesting requests, especially in the developing world. A volunteer team with A Better World Canada discovered this while visiting Mombo Health Centre this February in Tanzania. Barb Wade, Dr. Wayne Church, and Dr. Kelvin Hill were among those who helped assess services at the small hospital. What they found were “really interesting cultural differences” on the hospital’s wish list, said Wade. They learned the community’s big priority was a mortuary where deceased individuals would be stored in refrigerated units temporarily and also where family could come to grieve. Often, there are issues for families coming from a distance to this community where half the population is Muslim. Wade, who sits on ABW’s health advisory committee, said the request is unique, considering in Canada, funeral homes and morgues are commonplace. The health advisory committee will forward recommendations to the ABW board, which decides on what priorities will be sponsored and when. These assessments, including those recently done in Kenya, show that ABW is concerned about improving patient outcomes. It’s also ensuring sponsorship dollars are appropriately spent. Wade was impressed with what the hospital could do, despite a lack of resources. Part of her job will be pulling together a budget to further implementation. Dr. Wayne Church (left) and his wife Dr. Paulette Comeau meet with Waziri Semarunda who runs the private Fajara Cogi Dispensary while his laboratory technician and Dr. Kelvin Hill watch on. The ABW team has recommended an oxygen concentrator for the clinic. One recommendation involved separating the medical and surgical patients rather than having them in the same ward. The mortuary could be done at any time, she added. “If there’s a donor who could fund it… we said it’s appropriate, we need one,” Wade said. “She asked us to go to the health centre and take a look at it,” he said. The group conducted a basic inventory of all buildings at Mombo. During their tour, they noticed roofs were leaking, causing staining. The ABW team recommended a number of priorities, including the complete reworking of obstetrical services. Church, a family physician from Red Deer, described how different it is for a woman giving birth in Tanzania. For instance, there’s only one delivery room at Mombo with two beds in it. There’s no warming bed once the baby is born, either. No private rooms for women who just gave birth. They’d be sleeping in an eight-bed ward that includes one bedsheet and one mosquito net for each. The ABW team also observed other differences from back home. Men and women have their own wards. Patients do their own laundry and rely on family and friends to bring food because washing and kitchen facilities aren’t present. Plans are to install a washing machine. Besides the Mombo Health Centre, the ABW team toured through the Korogwe district hospital and two dispensaries (medical clinics) in the northeast region of Tanzania. Dental services are not typically found in hospitals and clinics in Tanzania which is why ABW focused on this area, too. Dr. Kelvin Hill inspects the Mombo Health Centre’s trauma room located inside the operating room theatre building. 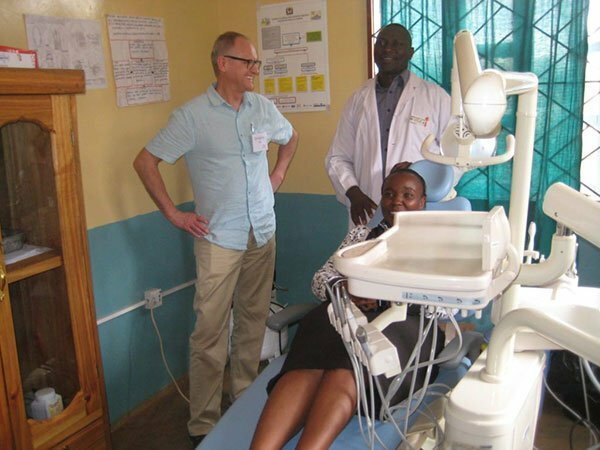 Hill, a dentist from Lacombe, Alta., learned that dental services are hard to get in Tanzania because there’s a drastic shortage of dentists. One recommendation he made included supplying Korogwe’s regional hospital with a new dental chair and other equipment. He found it’s important to evaluate all needs, versus just giving a piece of equipment that someone has requested. “We need to look at the whole picture,” he said. Part of his mandate is to put together a plan on where ABW’s resources would be most effectively used. “When you talk to the critical health officers, they’ll tell you anywhere from two to six people a day need some kind of dental services… that means extraction because they’re in pain,” he said. The team’s overall experience was rewarding. 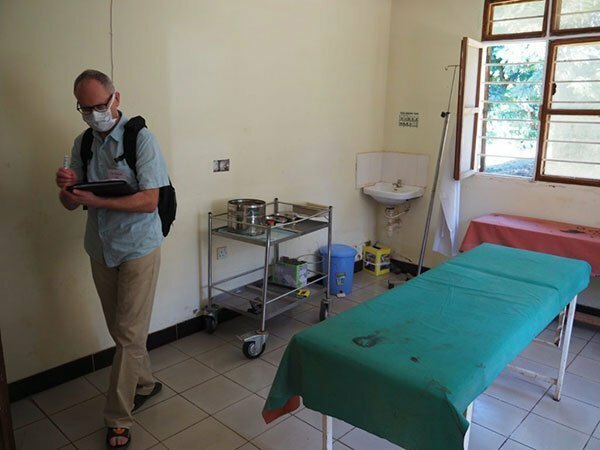 Wade has traveled with her husband Len, a physician, to ABW projects a number of times within East Africa. The couple recently moved to Calgary from Vulcan in southern Alberta where Len continues his family practice. “Unfortunately, we didn’t spend a lot of time (in Tanzania),” said Wade. “This was really the first toe in the water, we were just there a couple of days. We asked the questions and accepted the answers on face value and often it’s correct. It’s our misinterpretation (because of language issues) if it’s not correct.” The longer you work somewhere, the more it makes sense, she added. Church and his wife Dr. Paulette Comeau have similarly been on medical trips, but this was the first assessment they had done. Church expects any changes made as a result of this assessment will make a difference in the lives of many, he added. Hill and his family took their first ABW trip in 2005 to take part in rebuilding efforts in Lacombe, La. following Hurricane Katrina. This was his first trip to Tanzania. Dr. Kelvin Hill gets to see a dental chair sponsored by ABW put to good use by dental therapist Bakari John Mika at the Soni Dispensary. Further treatment was facilitated through Hill. Doing such work is very rewarding, but not sustainable in the long run, Hill said. Five years down the road Hill said he would like to see self-sustainable dental services for all of ABW’s sponsored medical clinics. 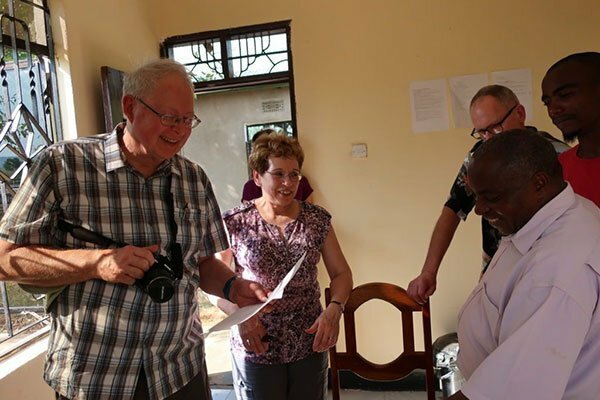 Church believes that Canadians will care about what ABW is doing to improve health care in East Africa and that includes upgrading equipment as well as medical training and services.